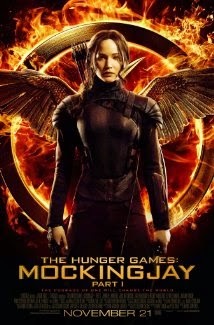 If you've seen the past two Hunger Games, you won't want to miss this one! Some may wonder “why drag it out for two parts?”, but the movie included a lot of extra scenes not in the book that made it necessary to split it in half. Mockingjay follows the book pretty good, but the added scenes from other districts during the rebellion and the sacrifices those people for the Mockingjay, aka Katniss Everdeen (Jennifer Lawrence) make it even better. If you ask anyone which book is their favorite, most would say the first and I agree. After watching the way director Francis Lawrence portrays Mockingjay, however, you'll probably like the third book better as well. Rebellion is the theme of Mockingjay. Part 1 shows what the capitol is capable of and what it does to its citizens, no matter if they're woman, child, or elderly. If you're against the capitol, President Snow (Donald Sutherland) will eliminate you. Mockingjay begins with Katniss in District 13, the base for the rebels and their leader President Alma Coin (Julianne Moore). Combined with Katniss and crew, they're a force to be reckoned with. Everyone makes an appearance, including Peeta, Gale, Primrose, Haymitch, Finnick, Effie, Johanna, Beetee, Plutarch, and the host of the Hunger Games himself, Caesar Flickerman. You'll also meet lots of new characters too. While in District 13, Katniss finds out Peeta is still alive and makes it her goal to get him out. She agrees to be the symbol of the rebellion in exchange for their help, but soon realizes she has to think beyond herself when the war escalates. Because Mockingjay is a two part installment, the way it ends will surprise and shock you. You'll probably have a good idea if you've read the book. Hunger Games Mockingjay Part 1 was incredible and I see myself going to watch it again. Twilight has nothing on Hunger Games and Jennifer lawrence, Liam Hemsworth, and Josh Hutcherson and the others continue to surprise me with great acting that bring the characters from the books to life.